Dr. Drew Pinsky (@drdrew) is a celebrity doctor who has been hosting shows — from radio to television to podcasts — for more than 30 years, most well-known for Loveline from 1984 to 2016. His current hosting duties include The Dr. Drew Podcast and The Adam and Dr. Drew Show among many others. How Dr. Drew reaches to the heart of an issue in seconds with his callers by listening with his whole body. People who seem to “have it all” are dealing with the same issues as everyone else. The difference between how Dr. Drew used to respond to criticism of his work compared to today. What experiencing imposter syndrome usually reveals about you. How we can spot the behaviors of addiction in others as well as ourselves. Over a lifetime of challenges, we all face periods of self-doubt, lack of clarity, and general directionlessness. Sometimes we just want to relax on a chaise lounge and seek the guidance of a licensed professional to set us on the proper path. 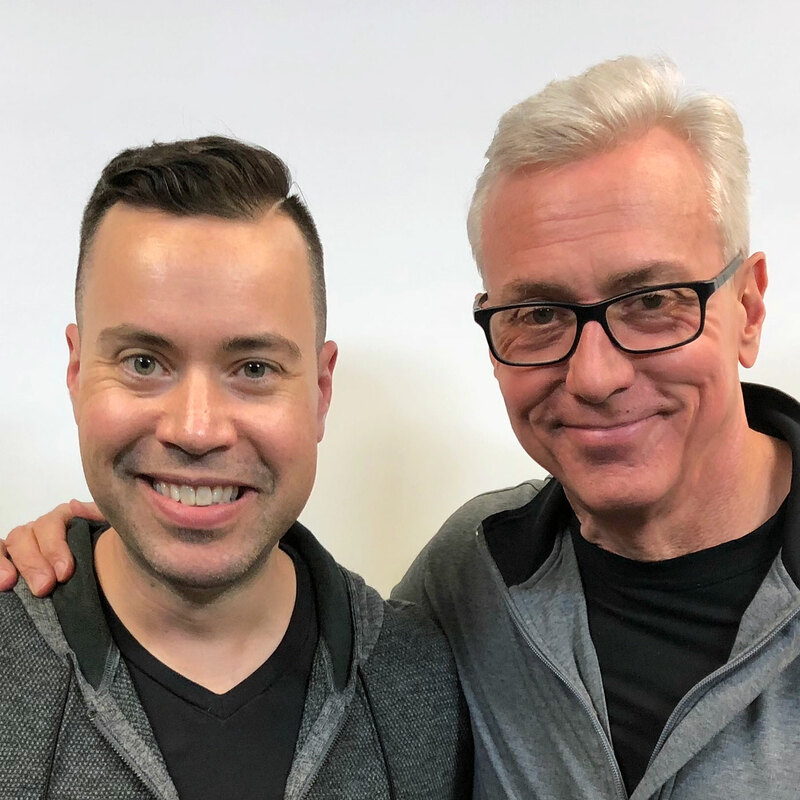 Dr. Drew Pinsky is just such a professional, and he takes a break from his usual gigs at The Dr. Drew Podcast and The Adam and Dr. Drew Show to join us for this episode. Listen, learn, and enjoy! ButcherBox delivers healthy 100% grass-fed and finished beef, free-range organic chicken, and Heritage breed pork directly to your door on a monthly basis. Get $20 OFF + FREE BACON in your first box by going to butcherbox.com and using the discount code JORDAN at checkout! Enter for a chance to win three signed books, a one-year subscription to the Next Big Idea Club, and a personal coaching session with Jordan Harbinger by going to jordanharbinger.com/heleo! Dr. Drew — formerly of Loveline, currently hosting The Dr. Drew Podcast and The Adam and Dr. Drew Show among others — is famous for getting the heart of an issue in seconds with people who call him for advice, and he does this by listening with his whole body — not just his ears. In a matter of seconds, he can easily discern between what’s real and what’s bogus — as demonstrated by the time he identified someone with multiple personality disorder live on the air. But as good as he is at rooting out the source of problems his callers may have, Dr. Drew has caught flak from some for coming up as anything short of a miracle worker. Over the course of his hosting duties for shows like Celebrity Rehab and Teen Mom, he’s been blamed when cast members have died — sometimes years after their episodes have aired. It’s a bit like being blamed for someone getting a DUI last night because you happened to be their bartender four years ago. “I used to be exquisitely sensitive to criticism because I wanted to be perfect and do only good!” says Dr. Drew. “I remember when Adam and I wrote our first book. It was just sort of an advice book years ago. And we just wanted to make a difference. We wanted to help. And I remember it was the beginning of Amazon and you were allowed to have comments from readers in your little book section. I was devastated by some of the things people were saying. And what they were saying then was nothing compared to what goes on these days! I mean nothing. And I was so hurt and so upset and so affronted professionally and my reputation had been harmed. As Dr. Drew has learned, people will ascribe all sorts of inappropriate motivations to you if you’re in the public eye no matter how hard you’re always trying to do the right thing. At the end of Bombshell: The Hedy Lamarr Story, the famed actress and inventor reads a poem by Kent M. Keith that urges us to “do good anyway” even when it seems like the world is against us. And while Dr. Drew says he’s gotten used to the pummeling, he’s still not immune to it. Listen to this episode in its entirety to learn more about what really happens when people are under siege by dissociative disorders, how Dr. Drew keeps from being emotionally deflated by bombastic media backlash and how it differs from the way he used to deal with it, why Dr. Drew still follows his calling to practice medicine in spite of numerous media successes, why self-esteem doesn’t care about success, the difference between mental health and mental wellness, and lots more. Click here to thank Dr. Drew at Twitter!